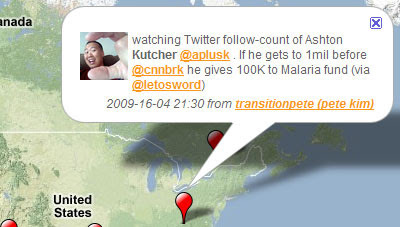 For those obsessed with Ashton Kutcher, and it seems there's nearly a million obsessed enough to follow the star on Twitter, i-Spirit have created a Google Map mashup that plots the latest Tweets about Demi Moore's husband. And not just Kutcher, the i-Spirit map also shows the latest Tweets about Barack Obama, Bill Gates, Britney Spears, Mark Zuckerberg, Ronaldo and Nicolas Sarkozy. The map takes a leaf out of the twittervision book of map interaction and animates through the different Tweets directly on the map. Consequently the user can just fire up the map, sit back and watch the celebrity gossip fly across their monitor screen. Like other i-Spirit maps the celebrity map comes with the option to embed it in your own blog or website.